Impulse wave: Three parts that go in the trend direction, alternating with two that go in the opposite direction. Corrective wave: Two parts that go against the main trend and one that goes with it. If a bull market reaches a new high in five waves instead of three and also goes down in five waves instead of three, you’re witnessing the beginning of a major bear market. You will often see three clear waves up, although sometimes a move has more upwaves than three, as in this figure. The three-waves rule is only the model of how markets move, not a rigid orthodoxy. Elliot Wave practitioners are the first to admit that calling corrective waves is tricky, much harder than seeing impulse waves. 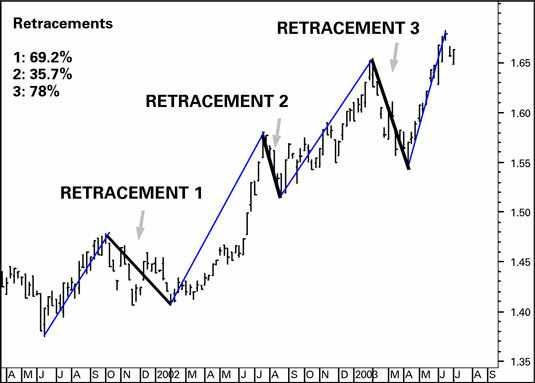 Experienced practitioners advise against straining to make a correction “fit” the Elliott Wave model. A correction often just keeps on going, too, whereupon it isn’t a correction but a true reversal and thus a new trend in the opposite direction. Counting waves can be an elaborate and time-consuming process, and miscounting while prices evolve can result in losses and having to start all over again. If the wave idea appeals to you, be prepared to devote a lot of time to it. If you choose not to count waves, you can still benefit from the observation that trends start with an impulse wave that then retraces in the opposite direction before the trend resumes. “Buy on the dip” isn’t bad advice when you are sure that you have a trend.